If you’re looking for a fun Valentine’s skit … DYM author Bob Anderson (check out more of his great resources here) has donated a fun 2-page skit about girlfriends and love you may want to use this Valentine’s season. This skit is great for the Valentines season for student ministry. Use this skit for fun or to set up your “love series” teaching time. 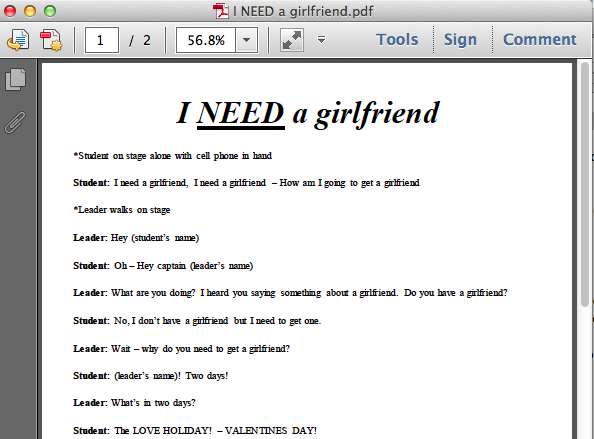 I NEED A GIRLFRIEND is a skit about a student that feels like he needs a girlfriend and only has a couple days before Valentine’s Day. His youth leader comes on the scene and after consulting Siri for advice determine that the Valentines gift that the student already bought for his hopeful girlfriend may have to be enjoyed by the student and the leader. Download it here, and check out his other resources, too!